Missing apples this fall?! Chayote squash might just be the answer! 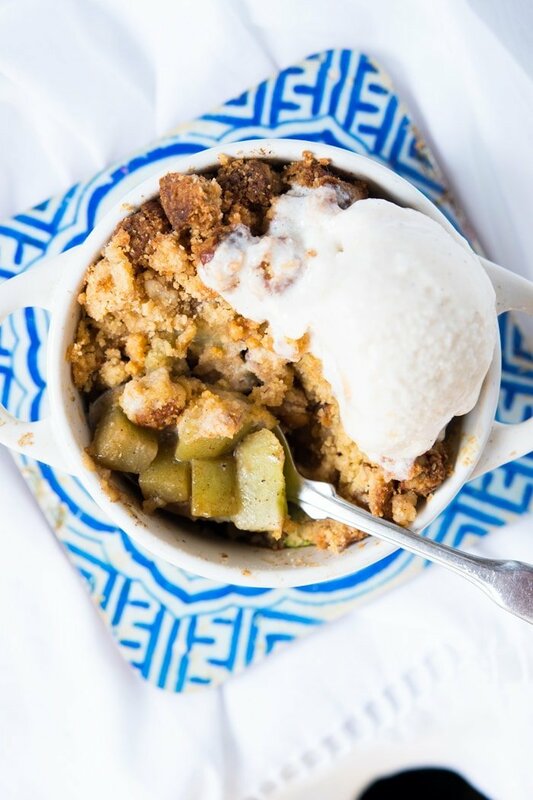 Its crisp and juicy texture lends itself as the perfect sub in this keto apple crumble! Crisp, sweet, and quite apple-like, chayote is a great low carb apple substitute (with the help of a little bit of extract)! 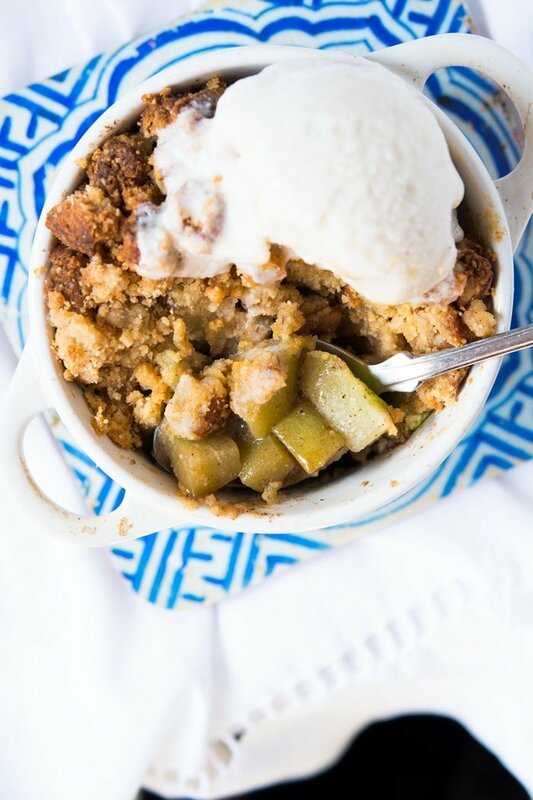 So if you’re missing all things apple this fall, you gotta give this keto apple crumble a go. If you’ve been doing keto for a while, odds are you’ve heard of chayote squash subbing in for all things apple. 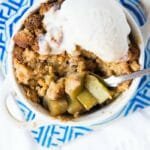 From a classic apple pie, to keto apple crumble, and even English minced pies. So we decided to take this traditionally Mexican veggie for a ride. Chayote, crisp and mostly taste-less, is an interesting veggie. Related to melons, cucumber and squash, it’s traditionally used in savory dishes in Mexican cuisine. And aside from being low carb (think just 2.8g net carbs/100g serving), chayote is rich in dietary fiber, iron, manganese, phosphorus, zinc, potassium, copper, vitamins B1, B2, B6 and C. Not to mention a bunch of antioxidants. And living in Mexico and all, we couldn’t wait to give it a shot given that we adore all things apple come fall. This apple extract is a real wonder. It helps to up the apple factor up quite a notch. So if whipping anything apple/chayote this fall, make sure to get hold of this extract. Apples, unlike chayote, are rather acidic. So you really need to up your acid factor via lemon juice here. I suggest starting with 1 tablespoon, and adding more as needed to taste. We were oddly divided by this keto mock apple crumble at chez gnom-gnom (as in me, friends and my mom who regularly judge ‘how close to the original I got’). It’s super yummy don’t get me wrong (I wouldn’t be posting it if it weren’t!). But during tasting, it seemed that the apple-ness factor varied from taste bud to taste bud. It seems that for some peeps it tastes almost like apples, and to others it simply doesn’t quite do it (yet still confirm it’s a yummy dessert). So I suggest you give it a go, in case you’re one of the lucky few to whom chayote tastes like apples. Plus, the filling is also super yum as a yogurt or chia seed pudding! Oh, and I’m fairly certain that our (no-churn!) 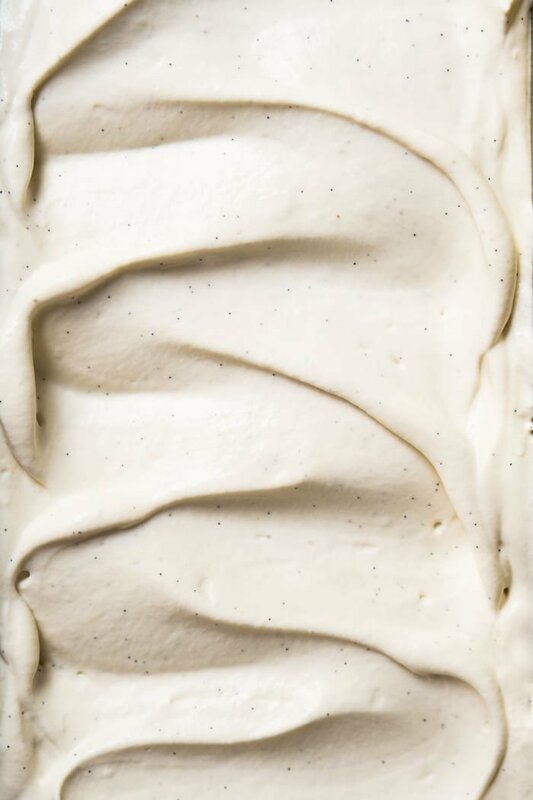 vanilla ice cream is non-negotiable!! In all my tests with chayote, I found that a thickener (i.e. arrowroot etc) is not really needed. You see, chayote has a funny quality in that it releases some water at the beginning of cooking and after 15 minutes or so it soaks it all back in. So when I added arrowroot (or even tapioca), the crumble came out all dry and clumpy. But when we let it do it’s own thing, the texture came out just right after 30 minutes of baking. Slightly crunchy, yet nice and tender. If you’re planning on making a mock apple pie with chayote, this poses a slight problem. Unless you’re doing a skillet pie with just a crust on top, the chayote will make your bottom crust all soggy. Alternatively, you can cook your chayote filling on the stove-top first to release the initial moisture, let it cool and then use it as your keto apple pie filling! Apples are clearly much sweeter than chayote. As in, chayote is not sweet at all. So you’ll have to do some tasting here, to cater to your sweet tooth. You can pretty much use whatever sweetener floats your boat. Xylitol (non-corn though to avoid tummy troubles!) is my top choice (no aftertaste! ), Lakanto (barely any aftertaste, and the Golden version would be particularly good here! ), and Swerve (some cooling sensation, but still great). Pyure also works, just note that it’s not my top choice here. It seems that it leaves behind a slight stevia trace when the crumbles are warm, though it might just be me. Fun fact: it might also be my taste buds here, but I’ve noticed that stevia-based sweeteners (such as Pyure) work best when allowed to cool completely. Or even after a thorough chilling. i.e. when I made test batches with Pyure (stevia & erythitrol) and Sweetleaf (stevia), the stevia taste was very prevalent when warm (particularly with Sweetleaf). But after allowing them to cool completely, the stevia taste was barely discernible. If at all. Crisp, sweet, and quite apple-like, chayote makes for a great substitute if missing apples come fall! 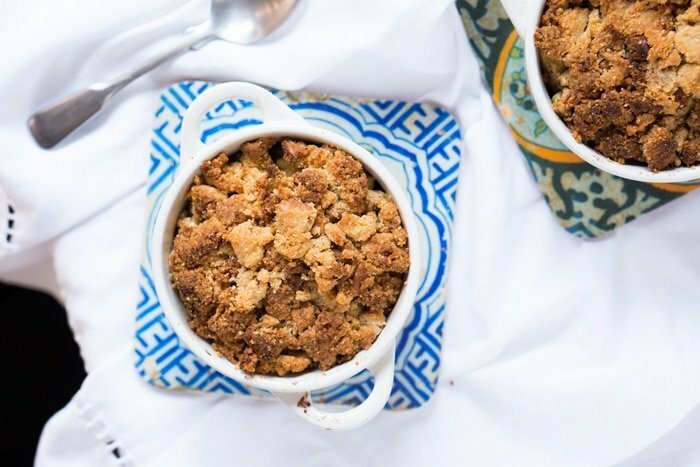 But before whipping up an entire pie, we suggest giving these keto apple crumble a try. Preheat oven to 350°F/180°C. 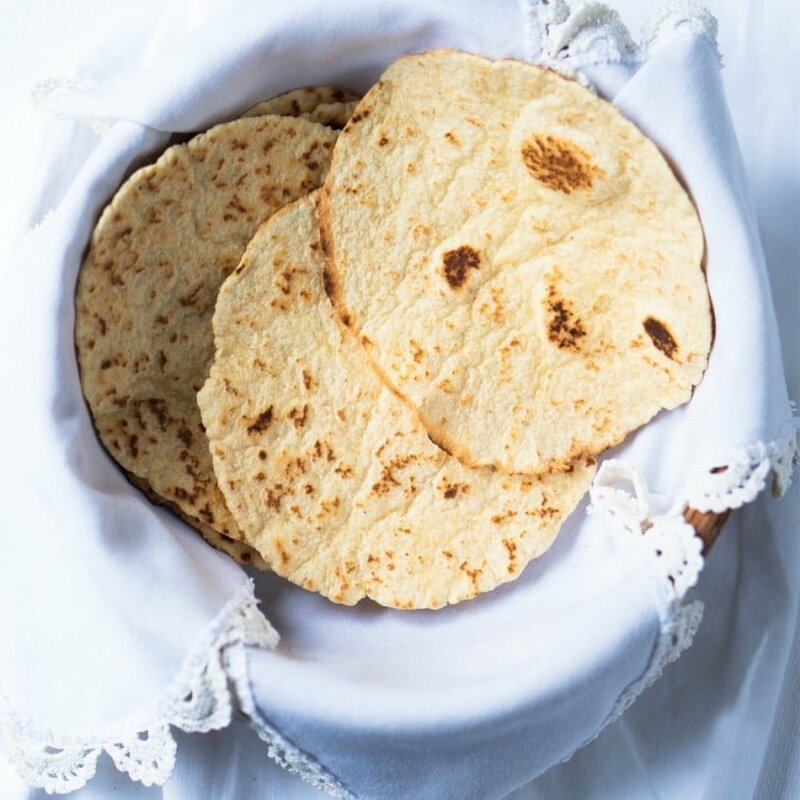 Lightly toast almond flour in a skillet or pan over medium heat, until fully golden and fragrant (2-4 minutes). This is very important taste-wise, so don't skip! Whisk thoroughly together in a small bowl the toasted almond flour, coconut flour, sweetener, cinnamon and salt. Add in butter and rub the mixture with your fingertips until it resembles coarse bread crumbs. Incorporate pecans and set aside. 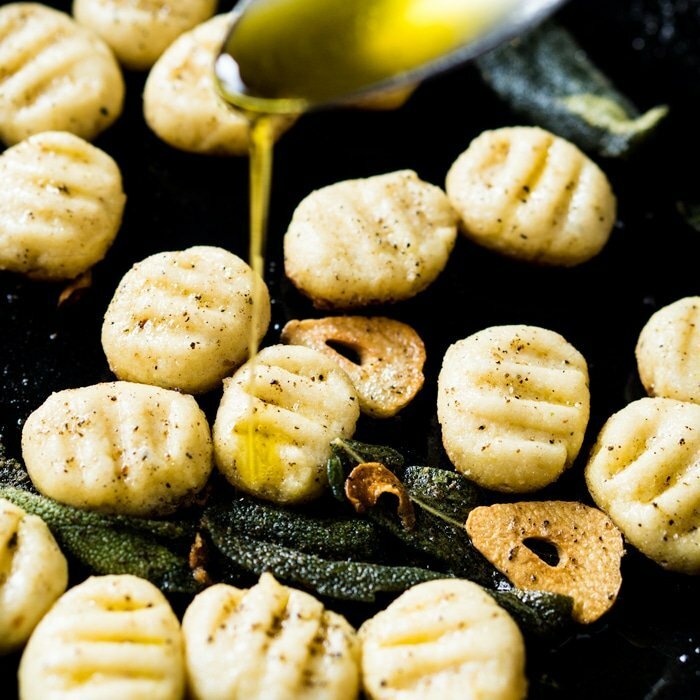 Mix together, in a rimmed baking tray or dish, chayote, sweetener, cinnamon, nutmeg, allspice and lemon juice (starting with 1 tablespoon, tasting and adding more as needed). Add in apple extract, starting with just 1/2 teaspoon, adding more to taste. You can alternatively cook the filling a bit on the stove-top to nail the flavors (my suggestion if doing a mock apple pie!). Top with crumble mixture and bake for 25 to 27 minutes, covering the crumble with foil after 10 minutes to avoid excessive browning. Allow to cool for at least 15 minutes to allow the flavors to mingle, or store refrigerated for up to 3 days. Please see post for deets on sweeteners and possible subs! what to do with the butter listed in the filling ingredients? it’s not mentioned in the filling prep. My good friend and neighbor introduced me to this wonderful “apple ” food. I LOVE it in apple cinnamon muffins and she also made some little hand pies with it. We boil them first then peel. Cut into slices or chunks for whatever you need them for. Cook with a little water, butter, sweetener, and spices. Everyone that has tried them say they taste just like apples. In fact, this morning I made your orange cranberry muffin recipe but used these “apples” instead. My friend also made an apple upside down cake using a muffin recipe. It was GREAT! Love, Love, Love this for apples. I grew up in New Orleans and we ate this squash all the time… we call it mirliton. Always savory with shrimp or crab in a casserole. They can be watery and sometimes after boiling we would let them cool so the water evaporates or if in a hurry squeeze the water out. When i made this i cooked them a bit in the spices and flavorings but i didnt want the to turn to mush. In the final dish they were still too crispy and even after baking and the dish was very liquidy. I would reduce the liquid/butter. I did not like the sandy texture of the crumble. I would replace with course ground nuts. Super delicious. I simmered the squash, sweetner, pumpkin pie spice, cinnamon, lemon juice, touch of salt, and butter for probably an hour and all the flavors infused into the squash I then followed the rest of the directions. Love the texture of the “apple” so delish! Thanks for the recipe! I’d assume you simmered after peeling it but did you also chop it as well first? So my goodness! This is amazing, my fiancé’s mom tried some and she hates squash, but loved it. I live in the US, so I had to look for the chayotes, but I found them at Walmart. Can’t wait to make it for Thanksgiving this year. I hate Apple anything. How do you think blackberries would work with this? I’ve seen recipes using JICAMA instead of chayote. Great reviews too. Has anyone tried this substitute for apples? Jicama is awesome too, but I think chayote is more apple-like texture xo! Chokos wow I had no idea! Thanks so much for sharing Pea! I read that Xylitol is your sweetener of choice. I recently watched this small study and was wondering what your thoughts are about it. I adore your recipes and cheery disposition! Hi Shari! Yeah I’ve seen their opinion on it, but I don’t get the same effect at all! I also measure my blood sugar and ketone levels constantly and xylitol barely spikes it (if at all). I did have a reader comment once that it spiked her blood sugar (not enough to kick her out of ketosis though)… having said that, she did report back after that she had 5 pieces of brownie (and thats A LOT of xylitol!). So it is higher GI than erythritol, but still nowhere near maliltol and of course sugar. xo! Can you increase the coconut flour to eliminate the almond flour? I’m nut free. Also what about using Jicama in place of the squash? Hi Catherine! You can switch for coconut, but note the the flavor profile will change drastically. I would still go ahead and toast the coconut flour, as you get a nicer flavor that way too! And yes, jicama can replace chayote, but tbh I think chayote naturally has a closer texture to apples so it works best xo! Paola, I just discovered Chayote squash last week and it was wonderful used in a spice cake. I’ll have to try this recipe also. Your testing crew must be SO LUCKY!!! Can I join?!! LOL! 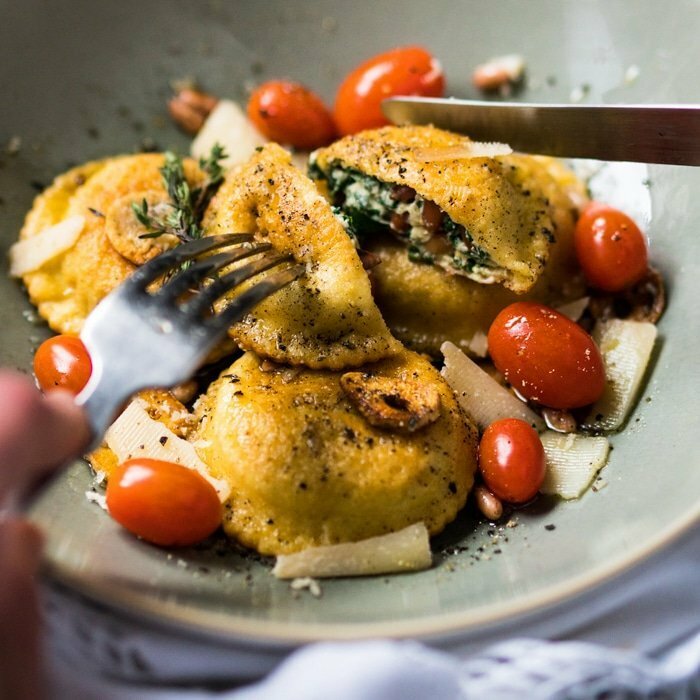 I would like to try this recipe for my kids (who eat moderate low-carbs). Do you think if I substitue the squash for apples it will still taste good? Why can’t I change to US Measurements? Nothing I do switches off metric! Help please! Thanks! That’s awesome to hear Chrissie! You can just add the butter diced, it’ll melt in the oven. And yup on the tasting (tasting as you go is the best way to yield best results!). A reader above you gave her method about cooking the chayote before, and that would give you the easiest taste-as-you-go results xo! I love love love love love your blog ….. Thank you Stephanie! There will be a keto summer cookbook with 40 new recipes coming soon! 😉 xo! Hi there, do you use raw pecans or roasted pecans in the recipe? Thanks! You can use either or! I have been following you for awhile and I love your recipes! Every one I’ve tried has turned out well and I have a list I want to go through and try. I have a suggestion for this recipe, though. I’ve been using chayotes to replace apples in pies, crumbles, and muffins for awhile now, and I have found that it is necessary to simmer them for at least 30-40 minutes (depending on how thickly they are sliced) to soften them and develop the texture of cooked apples before using them in a pie or muffin recipe. I do like you do, add lemon juice, sweetener, cinnamon, and apple flavoring. I’ve even taste-tested these with several people, simmering separate batches of apples, chayotes, and zucchini, all sliced the same way and sweetened and lemon juiced to match the sweet-tartness of the apples. Then I cooked all three to the same degree of softness, which took 5-10 minutes for the apples and zucchini and about 40 minutes for the chayotes. Then I had people taste and pick which they thought were squash and which were apples. Every single person has identified the prepared chayotes, along with the apples, as the “apples”, and the zucchini as the “squash”. I’m thinking that if you do the precooking of the chayotes, they might taste more “apple-y” in your pie or crisp. Hi Diana! So happy to hear you’re enjoying the recipes so much. And THANK YOU for your thorough tip, I’ll definitely be trying it when I next bake with chayote 🙂 xo and thanks again for sharing! I was thinking the exact same thing….precook the chayotes to get rid of the excess moisture and “let it do it’s thing” and blind bake the bottom crust and do a “french/dutch” crumble on top. Even when I make regular apple pie, I sometimes bake the crust first, baking a pie shell, and then either a circular piece of pie crust, prepared, or little pieces of baked crust, then I cook the filling on top of the stove, cool a bit, then put the filling in the baked shell and put the cooked pastry pieces on top. That will solve the soggy crust problem. I have ordered sugar free apple spiced cider drink mix to season the chayote “apple” pie, too. is the 300 grams BEFORE or AFTER peeling? Hi Monika, it’s after peeling… but feel free to play around with the chayote to crumble ratio to your liking! Thanks for sharing this! I miss living in the US, where getting my hands on something like chayote squash would’ve been really easy. Here in the UK, it’s a bit more complicated. Boo. However, I’m going to steal your recipe for the crumble topping and use it over blackberries and maybe softened jicama to make a good crisp! HA! I actually lived in the UK for 7 years… remember exactly what you can get! I remember I did see jicama a couple times, and it’s also a fairly good sub for apple (and even French fries!). this is true, i’ve tried using chayote as apples and surprisingly my kids absolutely loved it… me not so much! Exactly! It’s definitely a taste thing, and also worth trying in case you’re one of the lucky few!